My Stats page tells me that hardly anyone reads blogs on a Saturday or in the morning, but it scarcely matters as I’ve nothing to say. This week, I’ve been flat out in bed with sickness, and I’ve been unable to think of a topic, let alone write an entry. I aim to be back on track by next week. In the meantime, as it’s Independent Booksellers’ Week, I encourage you visit your nearest one and buy something. A couple of entries ago, I mentioned that I rarely post my work on the Web. This is because I enter competitions and contact publishers. The rules invariably state that any story submitted should never have appeared either in print or online. I have one story that’s already in the public domain, and I’m going to share it with you below. I wrote it for a Twitter friend, and it gives you a flavour of my style, although I don’t usually write in American English. Monday, and for the third week in a row, I took to the streets of downtown Ladymill. I had made some acquaintance with a few of the commuters, one of whom had bought me a cup of coffee every day last week. But as pleasant as it was to meet these people, I wasn’t doing this for the friends. I desperately needed something that nobody seemed able to give me. I perhaps should explain why I attracted so much attention. I’d been carrying two dry-erase boards attached by two ropes over my shoulder. The one on my front read: NEED A JOB. CAN’T GET MORE WELFARE. Oftentimes, the rain washed off the semi-permanent ink and I had to rewrite it two or three times. The blank board on my back allowed potential employers to write down their details. So far, I had only attracted a couple of comments, including KICK ME and I’M WITH STUPID. But I believed this Monday would be different. Perhaps it was the optimism from the sunnier weather, or that the commuter’s coffee had gone straight to my head after an inadequate breakfast, but I definitely felt a new sense of being. As the commuters thinned out at around six o’clock, no doubt rushing home for a well-earned beer, I considered finishing up for the day. But I had no beer, just leftover Chinese food. I arrived as instructed wearing my most professional outfit. The office looked very glassy and modern, and didn’t contain many staff, so I could work almost uninterrupted. Yes, I could do this. No more rainy days wandering around town. I was now an office worker. I signed a month-long contract that day. I soon found out why there were so few staff. This advertising company wasn’t offering a desk job. They wanted people to walk around the streets with billboards strapped to us. As writers, we should all protect our most valuable tools of the trade: our fingers. Lately, I seem to have been using them a little too much. I’ve taken leave for a week, and I’ve seen a physiotherapist. So this post is brought to you by Dragon NaturallySpeaking voice recognition software. This type of technology has improved enormously since Stephen Hawking was kitted out with a synthesiser. Only today, I found a CD-ROM containing ViaVoice 98. That was a nightmare to use. You. Had. To. Speak. Each. Word. Individually. Nowadays, you can speak in your everyday voice. Dragon is actually relatively accurate, even though I have a Scottish accent. That said, it reset itself for no obvious reason as I was about to type this entry so I’ll need to recalibrate it. I don’t mind because the calibration text is excellent, including excerpts from 2001: A Space Odyssey and Dogbert’s Management Handbook. Just as handwriting can produce different results from typing, so can dictation. By speaking the words out loud, you can hear the cadence as you go along, or if you have a new idea while writing, you can record it before it’s forgotten. One word of caution, though: it’s not cheap. Dragon for individuals starts at £79.99. Happily, if you own Microsoft Word, you already have this feature. Have a look at the Help menu to find it. EDIT: Since writing this entry, I’ve been advised that the facility is not available in Office 2010 on XP. Never has Earsham been so lauded. There’s a reason you rarely see my work on the Web. When you send work to publishers or competitions, their rules normally stipulate that the work must not have been published elsewhere, including paper books and online. This entry is a rare exception. On Friday 23rd May, I had the privilege to see Rally & Broad, Luke Wright, Lake Montgomery and Alan Bissett for the second time, plus others for the first time. At the event, the organisers ran a Poetry Bingo competition, encouraging the audience to circle off twelve words as they heard them in the show. In addition, there was a challenge to use these twelve words in an original poem, and the winner would receive a ticket to the last show of the season. I’m pleased to report I was one of three winners, and my effort is below. how, where, why and when of it. could keep his sickness benefit. See which one you prefer. We do love to stretch our audience’s artistic glands. 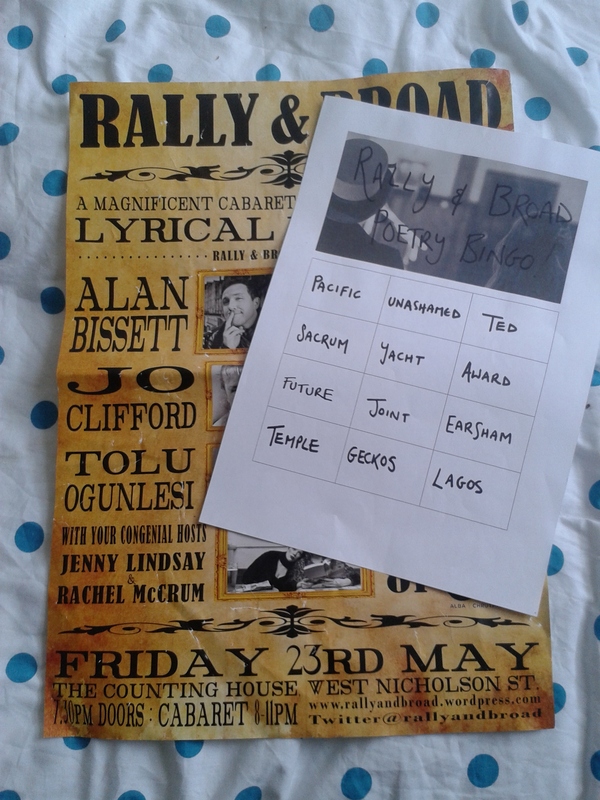 At Rally & Broad’s last outing, ‘Ye Dancin’?’ (May 2014), we went for a bit of good ol’ poetry bingo – our esteemed poets and artists gave us some words that would be guaranteed to pepper their sets, and waited for ‘HOUSE’. And just to flavour it further, we promised a free ticket to our season finale to the best* poem that could be made up from the words on the bingo cards. *best proved a tricky concept for us to qualify. Oh we tried, readers, we tried, but Rally & Broad are different and passionate beasts in their own fiery ways and had to agree to differ before fur flew. Thus, we have three winners: Rally’s Favourite, Broad’s Favourite and Definitely Most Amusing.